of NOIRE at the Night Hotel and finally the kickoff of OUR HOUSE at downtown dance space DROM. Our resident DJs Jon Martin, Shifty Kid, Delmar Browne and Wayne Louis have been busy working the decks at clubs, lounges and hotels, on internet broadcasts and podcasts – and we’ve had the great fortune to welcome a stream of stellar guest DJs from around the world to play with us, bringing their unique track selections, styles and energies. together, and to meet so many new ones who also appreciate the power of great music, and although we’ve had our setbacks along the way, we are PROUD to continue pushing forward with our mission of BRINGING EXCEPTIONAL PEOPLE TOGETHER THROUGH EXCEPTIONAL MUSIC. who’ve participated, contributed or supported us this year! Without you, there would be no sub:culture … you can bet your last dollar that we will continue to grow and expand in 2012 – with events at new venues and old familiar spaces, new podcasts, broadcasts, remixes and releases, and of course a cross-section of some of the most interesting, creative and downright fun characters on earth or anywhere else! With that, WE THANK YOU – and wish you and yours the most fabulous holiday season imaginable. December 26th for a FABULOUS night of dancing and debauchery, alongside MUTED MONDAY resident Mike Dominico and host Big Papa, at Sapphire Lounge (249 Eldridge St, New York, NY) … we’ll be desperately dancing off those excess holiday calories … and we hope to see you there too! 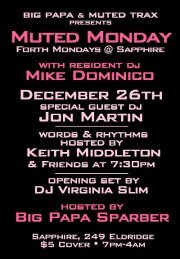 The Launch of MUTED MONDAY @ SAPPHIRE will include special performances from a unique and talented blend of people brought together for this special night, with DJ sets by resident MIKE DOMINICO, special guest JON MARTIN an opening set by DJ VIRGINIA SLIM, along with a special performance of words & rhythms by the “Wildchild” KEITH MIDDLETON. VIRGINIA SLIM warming things up with an eclectic mix that’s good for the soul. A percussionist and bass player, Slim has played nationally in multiple musical genres including Brazilian, and tonight brings us his talents on the decks. Then at 7:30pm the floor opens to a special performance of words and rhythms with Brooklyn’s own “Wildchild” KEITH MIDDLETON who’s many credits include long-term member of the percussive performance dance troupe STOMP. Keith and friends will be bringing their thought-provoking words and underlying grooves to the gathering. Following the performance, MUTED MONDAY Resident MIKE DOMINICO jumps into the mix building the night with deep grooves and rhythmic beats. Life-long, New York City DJ, owner of MUTED TRAX (the record label) and producer of countless quality house tracks, Dominico will work the floor and all those on it. This month’s special guest on the decks, JON MARTIN, has been a staple in the New York underground music scene for decades and a leader in his efforts to bring quality back to the New York scene with his SUB:CULTURE movement, NOIRE@NIGHT and OUR HOUSE parties. Jon’s unique and eclectic taste in dance music is sure to make this a night to remember.